Buying cereal for kids can be a hard task. It's difficult enough to figure out which of many cereals lining the shelves of the aisle are good for you. You also have to find a cereal that will appeal to kids. But there are a number of cereals that will provide your kids with good energy in the morning and are low in sugar and high in fiber. Cheerios are at the top of our healthy cereals list. Per serving, they have 1 gram (g) of sugar and 3 grams (g) of fiber. You can introduce them to your children as a finger food when they are very young, and as your kids grow up, they will be hooked on the taste. For more flavors (and vitamins), add berries or bananas to your kid's bowl. Cornflakes are a great combination of healthy grains and nutrients. Cornflakes contain a healthy 1g of fiber and only 3g of sugar. Try to steer kids away from Frosted Flakes, however, as the "frosting" is just unnecessary sugar that makes the cereal less healthy. Kix also contains 1g fiber and 3g of sugar, but it is relatively high in sodium content. Still, Kix is very kid-friendly cereal. However, Berry Berry Kix has 3 times as much sugar. If your child wants berries in his Kix, add real berries. Frosted Mini-Wheats are packed full of grains, and have a whopping 5g of fiber per serving. The sweet frosting appeals to kids, and while it does have 10g of sugar per serving, it makes up for this by having a high fiber and low sodium content. Like Cheerios, Life comes in different flavors. Plain Life is healthiest, and contains 2g fiber and 6g sugar, but it's bland flavor might not win the kids over. Cinnamon Life is more flavorful and contains only 3 extra grams of sugar. 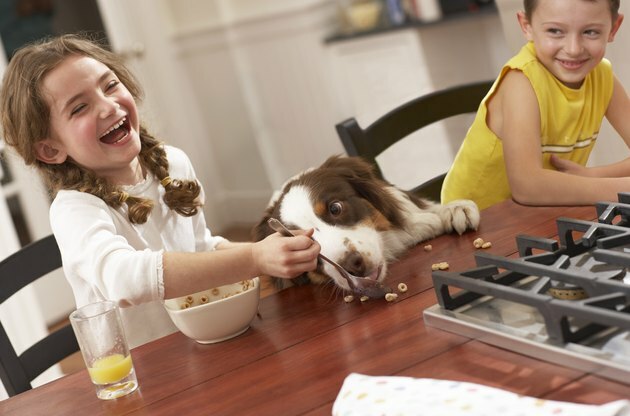 Honey Bunches of Oats' sweet taste is appealing to children. The way it is sweetened--with honey and other natural flavors instead of artificial sweeteners--should be appealing to everyone. This cereal packs 1g fiber and 6g sugar per serving. The "snap, crackle and pop" sounds of Rice Krispies are enough to make any kid want to eat (and listen to) a bowl of them. Rice Krispies have no fiber, but are free of artificial colors and low in sugar. Raisin Bran, with its 16g of sugar per serving, is very sweet, and it also contains 7 grams of fiber--a good deal more than many other cereals. Fiber is important to help your kids' bodies break down sugars slowly and keep their digestive and excretory systems moving. Muesli is similar to Raisin Bran, but contains even more ingredients. Your child will enjoy all of the dried fruits and natural sweetening in Muesli, which contains 26g of sugar, and 6g of dietary fiber to help your child's body steadily process it. Kashi Cinna-Raisin Crunch, with its sweet taste and crunchy texture, is a great cereal for both kids and adults. A bowl of Kashi contains 13g of sugar and 8g of dietary fiber. Many kids enjoy eating the crunchy Kashi mixed with smooth and creamy yogurt for breakfast or a snack. Consumer Reports: Better Cereal Choices for Kids?